Our STIN Hans J. Wegner The Chair is a faithful reproduction of this famous iconic furniture design. 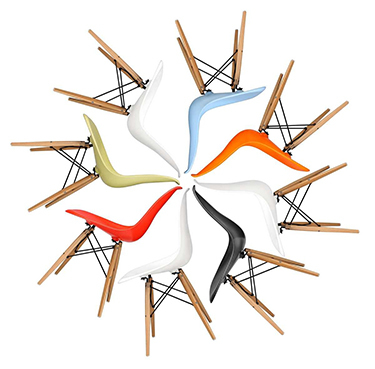 Hans J. Wegner's The Chair was originally named 'The Round Chair'. But after being used to seat John F. Kennedy and Richard Nixon in the first televised election debate in 1960, it became known as 'The Chair'. Our Hans J. Wegner The Chair has all the functional elegance and comfort of the original. The wooden frame is made from a choice of quality oak or ash and has a gracefully arched backrest that supports the body. The seat is lightly padded with high quality classic leather, making it perfect for everyday use. Very high quality. Cannot tell the difference between the original and this one. While I was waiting on the chair I was a little worried about the wood grain would be like proper uniform, and whether there would be likely to be color-shades of the wood. Concerns were happily proved wrong - the chair is fantastic - and looks like this looked better than it is in the picture. the wood grain is very nice, but I've been in a genuine (not replica) edition of the chair, and there are veins slightly more similar on both arms and straighter, which is probably because the replica is machine-sanded. the special and difficult assembly of the armrest three parts are made very flat. There is something that seems like a small cosmetic defects on one arm, but it may actually be that it's just a natural shift in the tree structure. I see no reason not to give the chair 6 stars. all in all I am very happy and it's not my last purchase from OSKAR. I received the chairs almost as promised, they were perfectly wrapped, it was actually difficult to extract them. The quality of the chairs is obviously not quite on a par with the original, nor can it be expected-. Sorting of the wood used could be better color differences-. The abrasion of the surface is made ​​evident by machine, since there are waves in accordance with the tree structure. stronger than the original, but it looks really very pretty. The chairs were received in a very careful and sturdy packaging, which had protected the chairs optimalt.Stolene fully corresponds to our expectations, and fits perfectly with our round egetræsbord.De are beautiful and great to sit in. While I was waiting on the chair I was a little worried about the wood grain would be like proper uniform, and whether there would be likely to be color-shades of the wood. Concerns were happily proved wrong - the chair is fantastic - and looks like this looked better than it is in the picture. the wood grain is very nice, but I've been in a genuine (not replica) edition of the chair, and there are veins slightly more similar on both arms and straighter, which is probably because the replica is machine-sanded. the special and difficult assembly of the armrest three parts are made very flot.Der is something that seems like a small cosmetic defects on one arm, but it may actually be that it's just a natural shift in the tree structure. I see no reason not to give the chair 6 stars. all in all I am very happy and it's not my last purchase from Stin. It was the first time we dealt with Stin, but it's certainly not the last time. 4 pcs. The Chair was received in solid packaging. Nice processing - perfect for our round oak table. A pleasure to watch.